Loyalty of the Dog is chapter one of What Animals Can Teach Us about Spirituality: Inspiring Lessons of Wild and Tame Creatures. 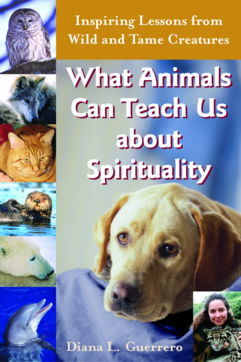 It introduces not only dogs, but also elephants, a sea lion, musk oxen, and some fabulous felines. In discussions about relationships, I relate stories that reflect themes of responsibility, balance, fairness, integrity, power, loyalty, honor, and justice. William, a homeless man, arrived at McDonald's to get his morning meal. Outside, on a blanket next to his bicycle, was his dog. An American Staffordshire mix, the dog was in good physical shape and was a healthy weight. As William returned to share his breakfast with his companion, the loyalty between them showed, and the mutual love shone brightly through their eyes. I asked William about this life and current predicament. The encounter impressed me, because his relationship with his dog helped William be a better man despite his situation. William took odd jobs for food and sometimes for money. This particular McDonald's fed him in exchange for his help maintaining the outside area of the restaurant. Both William and his dog slept out under the stars each night because William hated the attitudes of many of the homeless shelter helpers, the threat of theft, and the policy of "no pets allowed." The dog kept vagrants at bay. Inseparable, the two felt at home with the coyotes in the fields and the stars in the sky as their companions..."